We are always excited when a Virginia artist gets recognition for the contributions they have made to the southern gospel industry. In this case, it is Jeanette Cooke of the Singing Cookes out of Bristol, VA. Christian Voice Magazine holds a yearly awards show at SGM Fanfair in Piegeon Forge, TN May 3rd – 8th. The Living Legend Award is one of the many catagories you can vote for and will have awards passed out at the awards show. I would encourage you to go to the voting ballot and vote as you see fit. Click Here to learn more about the Singing Cookes and the Cooke Brothers. Technology just keeps getting better and better and once again Apple has the upper hand. This app is an improvement over current smart phone software. A company called Paware Mobile has introduced an app (and cradle) that will allow Iphone users to place their phone in a cradle and swipe credit cards through the cradle. Of course one of the break downs in the system is that the phone has to have service in order to connect to the verification company. No signal no connectivity. These transactions are still verified through VeriFone, so there wont be a whole lot of change there. 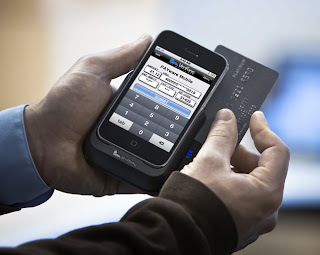 Apps for other smart phones exist but credit card numbers have to be keyed in which also results in the “business” being charged higher verification limits, in most cases. This also takes the artists away from quality face to face time with fans and has security concerns. If you would like to know more information visit the Paywayre Mobile links up above. With the hustle and bustle of everyday life and other projects for this blog to work on, I missed several big news items in the world of SG. 1. Ryan Seaton Launches Solo Career – Many were wondering what path Seaton would take after his departure from Ernie Haase & Signature Sound in December. On Monday, that question was answered, when he announced that he was partnering with Innovation Management & Consulting to launch his solo career. This is an interesting move; most of Ryan’s presence has come in the form of being a quartet man (Dixie Melody Boys & Signature Sound), so it is worth watching to see how his sound will evolve in the solo realm. Best of luck to Ryan in this new endeavor! You can keep up with him through Facebook and his website. 2. Triumphant Signs With Mansion Entertainment – In another unexpected change, Triumphant Quartet announced that they are leaving their longtime record label, Daywind Records, and signing with Mansion Entertainment, with promises of a new live project from The Mansion Theater. Wayne Haun will be producing. Bill Traylor has a history of making great things happen when he is involved, and as president of Mansion Entertainment, he’s made a great move by signing this quartet. 3. Dan Keeton Joins Blackwood Quartet – Earlier this month, it was announced that Ron Blackwood was coming off the road, Josh Garner and John Rulapaugh were leaving the Blackwood Quartet as well, and Mark Blackwood was bringing tenor Dale Evans and lead David Mann and merging the quartets together for a reloaded Blackwood Quartet. The changes have not stopped there, though; it was announced Friday that Dan Keeton would be replacing Dale Evans, as Evans is coming off the road to spend more time with his family. Keeton filled in with the group on recent dates, and “everything simply came together,” as he put it. 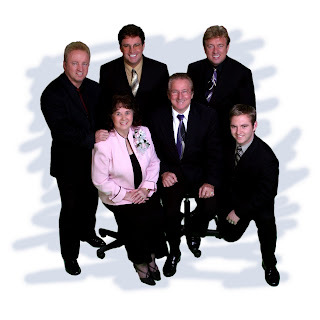 With the lineup of Dan Keeton, Mark Blackwood, David Mann, and Chris West, this quartet is a stellar vocal group. Mann has promised big things coming for the group on various blogs, so stay tuned. Thursday night, March 11, I headed over to Halesford Baptist Church in Wirtz, VA for a Gold City concert. The last time I’d seen a Gold City concert (not counting NQC), they still had Jonathan Wilburn, Steve Ladd, Aaron McCune, and Josh Simpson with them. This particular concert was being promoted as early as the end of 2009, but my interest increased after the changes in the lineup. I was looking forward to hearing the “reloaded” lineup of Gold City, having heard various Youtube clips and being impressed with what I heard. After A While – I think Tim Riley must have liked my reactions to him going for low notes; he kept looking at me the whole concert whenever he would do so! One Scarred Hand – This song was done a capella with no microphones. The acoustics in the church worked very well for this; check out Jeremy’s post about the evening for videos of this song and others from the night. Josh Cobb Solo (Satisfied) – I think Josh may have gone into David Phelps territory on the final note of this song. This is a great showcase of how he has developed as a vocalist since his Legacy Five days. It was a great night of music, and a good time was had by all in attendance. I enjoyed catching up with Roy Webb afterwards, and it was a pleasure meeting Josh Cobb, both of whom read this blog. If this group is in your area, I’d encourage you to go see them. You will be blessed!